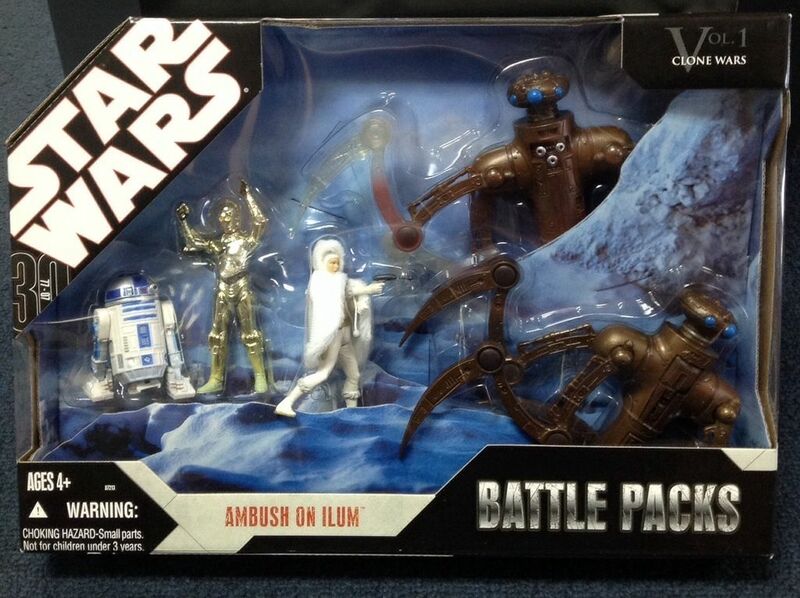 The Ambush at Ilum Battle Pack contains R2-D2, C-3PO and two Chameleon Droids in addition to the Padmé Amidala figure. The figures are in a more realistic style than how they appeared on screen. Based upon “Chapter 16” of Star Wars: Clone Wars, the final chapter in a three chapter arc which takes place predominately on the planet Ilum. Chameleon droids infiltrate a cave on Ilum from which the Jedi harvest lightsaber crystals. Jedi Luminara Unduli and Barriss Offee are present in the cave and fight the droids. Padmé who is transporting Jedi Master Yoda diverts to Ilum to rescue them. When Yoda is slow to return to the yacht she wonders off and comes face-to-face with four droids herself. This is the only multi-figure, multi-character pack to include an Amidala figure. While it has been pointed out that there have been far more Anakin Skywalker figures produced than Padmé figures, the number of carded figures is actually somewhat close. It is the large number of figures packed with vehicles or other figures that creates the discrepancy. I purchased several of these Battle Packs, all at Target, at prices ranging from $4.98 to $19.99.